Beachfront Condo with a 180 degree sweeping to the North is a view of Point Loma and the San Diego City Coastline with a view to the South of the Coronado Islands. The is view is spectacular! The master bedroom has a king bed with an adjoining bathroom. The 2nd bedroom has a queen bed and a bathroom. The kitchen is fully equipped service for 12 with a dishwasher, ice maker, stove with large oven, microwave etc. The living room, dining room, and the kitchen are all open to the windows on the ocean. You will experience the tranquil sound of the rolling surf while you relax and sleep. The condo has a large balcony with chairs overlooking the ocean and the sandy beach. We have Wireless High Speed Internet and Cable TV. We have bogie boards and sand toys. My husband and I bought this condo on our 30th Wedding Anniversary. We live in Poway about 45 minutes from the condo. We have lived at the same address in Poway since 1975. We both grew up in Orange County, graduated from Cal Poly Pomona and Long Beach State University and married in 1962. Our daughter has been married since 1991 and has two children. Our son has been married since 1993 and also has two children. Our family gets together often at the beach, Lake Powell, Colorado Camping and Park City. Family has always been the center of our life. We love Imperial Beach. It is one of the best kept secrets. The sand is beautiful. The people are friendly. Our condo is on the ocean. We love the sunsets over the Imperial Beach Pier, Coronado Islands and Point Loma. Our family all loves to come here. There are not many condos on a beautiful sandy beach. We have the 180 degree of the ocean. The sunsets are beautiful. We like to hear the sound of the surf. It is a thrill to see the dolphins, pelicans and whales. Local calls may be made from our phone without cost. As we are on the beach this is rarely needed. Will be charged extra for excessive use. King linens and Queen Linens provided Twin sheets for mats. Beach towels as well as regular bath towels, hand towels and wash cloths. New kitchen 2014. new cabinets, floors, granite counter, big double sink, new stove. Dishes for 12. 6 dining chairs You can bring in two chairs from the bedroom. Then you can set 8 around the table. We have cox cable with DVR on the Main 60 inch television. Balcony with chairs overlooking sand and ocean. Unobstructed view. A walker will fit. We have an elevator. the bathrooms and showers do not have handicap rails. The ocean is the best feature. There are not many places right on the ocean for your enjoyment. Watching, Listening and feeling the waves calms your inner spirit and renews life. Seaworld and Zoo are close by. Shopping is not far. Our family had a great vacation, condo was clean and met our expectations. Would recommend to anyone to stay again. Thank you for choosing our condo. It always makes me happy to know people are enjoying our Awesome Oceanfront condo. Thank you for the review. We had an amazing stay for our mothers/daughter trip! Great location! Condo was just the right size for 5 of us! Nice and relaxing stay on the ocean. We enjoyed our stay here. It was right on the ocean so we could listen to the waves from our balcony. The beach was clean, not a lot of people, and very relaxing. The owner did a good job explaining how to get into the property and garage, and explained the rules well. There were no surprises and everything worked as we expected. If you're grocery shopping, we recommend finding a Vonns or other large grocer as the one in town had limited options. This place met and exceeded our expectations. Everything was clean, in order, and what you would expect for a beach condo. We were here in the off-season and were looking for a quiet place to relax and explore from. 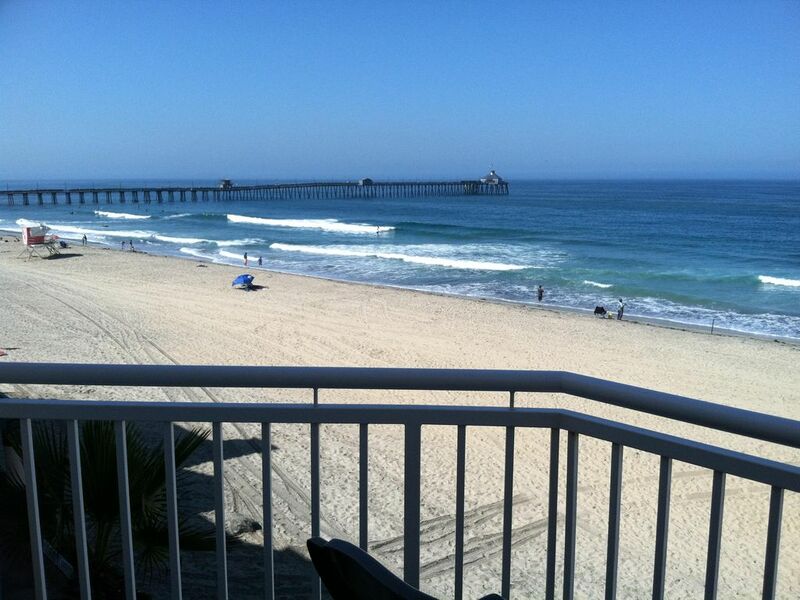 The condo and Imperial Beach delivered. Very low key, but still a great vibe and everyone is very friendly. We would not hesitate to stay here again. My husband, daughter, and I stayed for a week at this condo. It's located near Sea180, Surf Hut and IB Street Tacos. We went to the pool & hot tub twice on my daughter's insistence. Both are clean and in good working order. The condo has everything you can think of that you may need; wet suits, sand toys, beach towels, etc. It was perfect for us! This condo has the best views of the beach with some amazing sunsets. I wish we could have spent more time enjoying them. I highly recommend staying here! Thank you for your review. It always makes me happy when people have enjoyed our condo. Please come again. Would love to have you. My husband & I stayed at Carol's comfortably appointed, very clean oceanfront condo for one month & it was one of the most relaxing vacations we've ever taken. Since we're outdoorsy types we chose not to do sight-seeing or nightlife in nearby San Diego. Instead, we simply enjoyed walking the long stretches of Imperial Beach right outside the door, the Tijuana Estuary trails within walking distance from the condo, the long empty beach at Border Field State Park, which is flanked by the border wall at the south end & the Tijuana River at the north end as well as the many trails at Tijuana Recreational Area. Mission Trails State Park, north near Santee, also offered a variety of beautiful hill hikes ranging from easy to difficult. We bird watched every day & glassed both dolphins & seals from the sunny balcony & the nearby pier. The Super Blood Wolf Moon rose right out the front door over the beautiful gardens, a King Tide gently lapped the concrete wall banking the first floor units of the building two days in a row, very exciting, & my husband really enjoyed spotting the big ships out on the horizon regularly entering or exiting the San Diego harbor. He found a great site online offering detailed information about each vessel. Since both the Navy & Coast Guard have facilities in the area we also got to observe distant air, sea & beach maneuvers. I swam each day in the warm pool & only twice was joined by a couple of young families. Ditto the hot tub which we both enjoyed each afternoon. Carol's condo also has a lovely, deep bathtub which completed the trifecta of water indulgence for me. This is the perfect place to call home for a relaxing stay at the beach. The view is spectacular & the sound of the Pacific soothing like a lullaby. We found Imperial Beach residents & visiting guests to be super friendly, winter quiet & laid back. Restaurants abound right out the Club's street gate & Carol's spotless kitchen is well-equipped with everything you might need for cooking. This place is wonderful. Best of all, we're already planning to return next winter! Thank you for coming and choosing our condo. Sounds like you really enjoyed all the local things to do. Thank you for your review. I think this will help others to know all the special places close by. Thank you for taking such good care of our condo. Will love having you come again. San Diego Zoo - Sea World - Seaport Village - Coronado - Deep Sea Sport Fishing - Airport is 12 Miles - Disneyland is 120 Miles - 40 Golf Courses - Tennis - 30 Miles Of Bike trails - Paths - Whale Watching - Balboa Park - Air And Space Museum, Old Town San Diego, Horseback Riding, Gaslamp District and Amtrack to Disneyland. Trolley Station nearby. If you loose the keys or remote the cost is $200 will be deducted from your deposit. If you do not leave the keys and the remote found in the condo $200 will be deducted from your deposit. If you do not return the keys sent to you in 10 days $200 will be deducted from deposit.